Last weekend I had a bag full of potatoes, not wanting them to go off as often happens with veg in my house I decided to make a frittata. 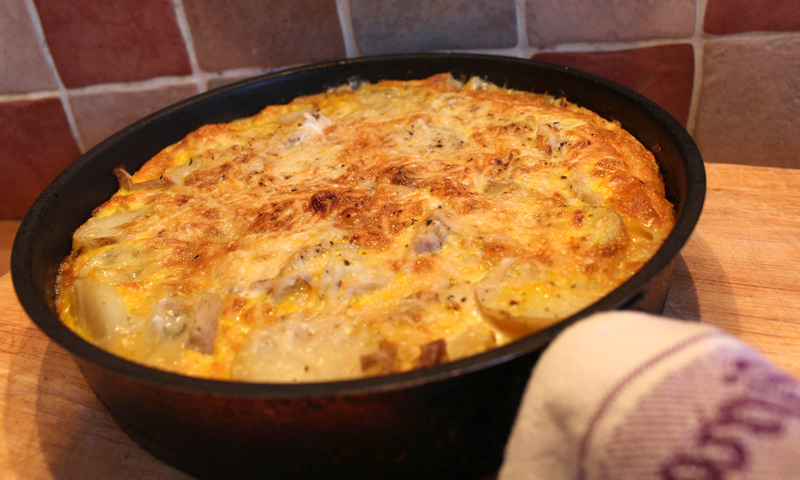 I was thinking about making leek and potato soup which is one of my favs but settled on a frittata as I haven’t made one in a while. Then it occurred to me to combine both and make a leek and potato version. Of course you can’t have a frittata without cheese so stilton being my favourite was added to the mix. This recipe makes about 6-8 portions, so it’s great to have hot or cold for lunches. Serve it with salad or just on it’s own. Slice the potato and leek into just less than 1cm slices. Taking a large pan (make sure it has a metal handle as you will put it under the grill later) set on a medium heat and add a knob of butter. When the butter is foaming add the leek and sweat down for a few minutes, then add a finely chopped clove of garlic. Continue to cook for a couple more minutes before adding the sliced potato. Mix the leek and potato up in the pan trying to evenly distribute the potatoes slices into layers. You can remove the leek from the pan and place the potato slices in a nice patterned layer if you wish, followed by the leek and another layer of potato. For me I find this a bit unnecessary and time consuming. While the potato and leek is warming through, whisk the 7 eggs and season with salt and pepper. Crumble the stilton evenly on to the leek and potato mixture and then pour in the eggs. Cook the frittata for 5-10 more minutes until the egg starts to set around the sides. The top will be still wet so it needs to go under the grill for a few minutes. Add the grated parmesan to the top on the frittata and place under the grill. It will be ready when the top is golden and firm. Leave to cool for at least 10 minutes before cutting. For best results serve warm.